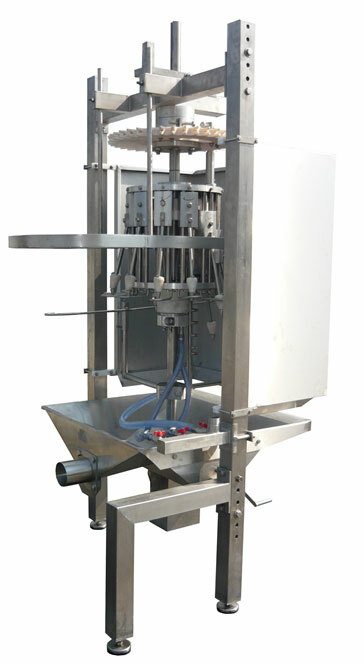 The device is designed for automatic external and internal washing of eviscerated chickens ranging from 0.8kg to 2.5kg. Main shaft, with a stationary cam drum made of plastic. Upper and lower support plates are mounted in the upper and lower part of the drum, respectively. Vertical guide sets are mounted between the upper and lower plate. Each guide set consists of 2 sliding rods and one slider. The movement of sliders is controlled by a ø50 plastic wheel mounted in the back part of the slider. The wheel is guided along the track of the cam drum. Pressure pipe with a washing head, mounted in the front part of the slider, designed for washing carcasses inside. The lower plate hosts the water distribution system with flexible hoses supplying water to the slides. Position of the carcass is stabilised with the help of specially shaped rods mounted on the lower plate. The lower guide is mounted in the lower part of the main shaft. Guides which ensure proper insertion of carcasses into the device and a washing collector for external washing of carcasses are mounted to the lower clamping ring. Drive to the rotating parts of the device is transmitted from the overhead chain conveyor by means of a drive wheel mounted underneath the upper transverse beam. Carcasses enter the device with their breasts or backs towards the inside of the device. The guiding rail, mounted to the lower guide directs them to the rods where they are immobilised. The pressure pipe is inserted into the carcass with the help of a slider. Washing begins after the washing head is inserted into the carcass and continues throughout the lowering and elevating cycle of the head until it is removed from the inside of the carcass. The external washing unit operates continuously.